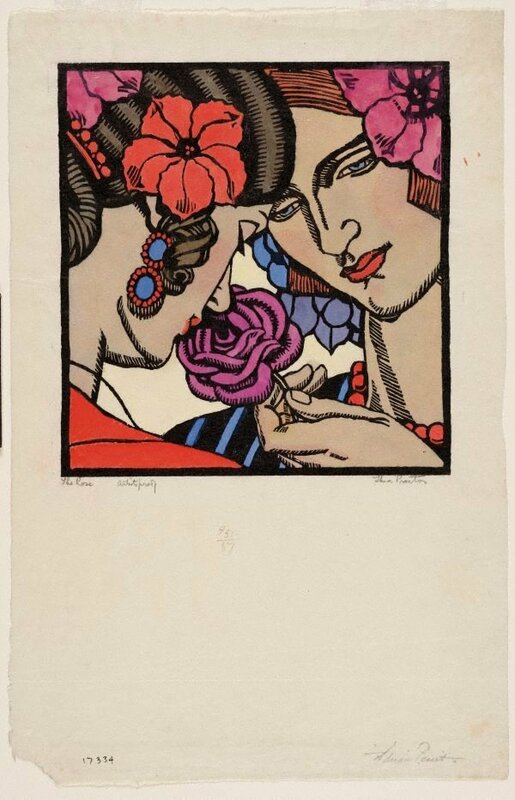 Proctor's image of fashionable, independent women and their shared pleasure in the fragrance and beauty of flowers, epitomises the artist's championing of the feminine. Its modern approach through a simplified, close-up view, in bright, unmodulated colour also reflects the artist's enthusiasm for Japanese prints. Based on a coloured pencil drawing, originally created as a cover for 'The Home' magazine, the artist's cousin Hera Roberts is seen on the right. Signed l.r., pencil "Thea Proctor". Signed within block to print u.r. corner, incised "TP [monogram]".